Wuhan, capital of central China’s Hubei Province, is the latest city to target jaywalking. A pedestrian in Wuhan waits for a red light to turn green ... and for ropes to rise on an automatic system that also indicates when it’s not safe to cross. Jaywalking has been reduced. At an intersection in the city’s East Lake hi-tech development zone, stands a giant frame which has a pair of ropes raised or lowered according to the traffic lights. The ropes stop pedestrians crossing on a red light and are automatically lifted to allow people to pass on green. The “smart pedestrian obstructer” has a small screen at the top warning the public to watch the lights. “This intersection has large pedestrian flows. Jaywalkers and vehicles are packed together during rush hour,” said Liu Ping, a traffic police officer. “Previously, police or volunteers had to hold ropes or blow whistles to stop people from crossing during red lights,” he said. “According to our calculations, around 90 percent of people obey traffic regulations. With this device, that rate was raised by another 5 percent,” he added. The device is intended to help increase traffic awareness and eventually it will not be needed, said an official with the city government. 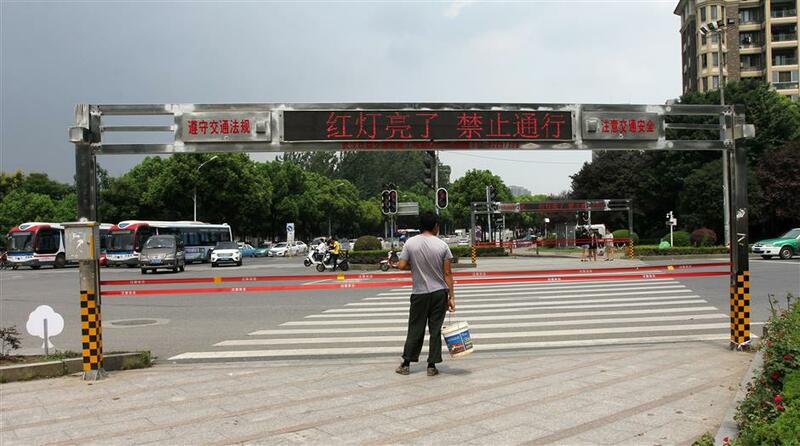 In Jinan, capital of east China’s Shandong Province, facial recognition equipment at intersections identifies jaywalkers and shames them by posting their photo on public screens. The photographs are matched with images in the public security database and fees are imposed on violators. Police said that since this new technology was adopted, the instances of jaywalking had been reduced from 200 to around 20 at day at one major intersection. The city now installed facial recognition equipment at 50 major intersections, with each device costing around 100,000 yuan (US$15,000).